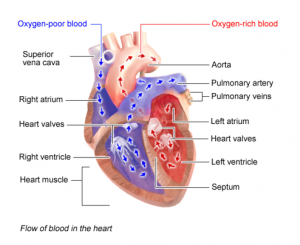 In our previous blog we looked at the construction of the heart and how it functions to supply the oxygen and nutrients to the body and how it also works to carry carbon dioxide and waste from the body. The heart would be useless if it did not have a system by which to transport and distribute the necessities of the body. 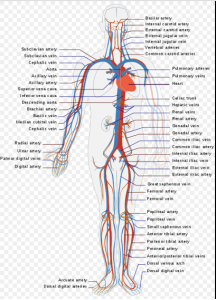 We shall continue our discovery of the workings of our body as we look at the role of the circulatory system. The mechanism in which the heart pumps its life giving fluid is called the cardiovascular system. This system is composed of three components: the heart, the blood and the blood vessels. It is manifested in two phases, the systemic and the pulmonary. The systemic portion is that part which delivers oxygen rich blood to the different parts of the body along with nutrients necessary for production of energy in the cells of the body. The avenues through which it delivers its cargo are called arteries. The pulmonary circulation system is the one that carries oxygen depleted blood away from the cell back to the heart through veins and then from the heart to the lungs where it exchanges carbon dioxide for oxygen. The blood which is pumped through this system is composed of four things: plasma, red blood cells, platelets, and white blood cells. Each of these have their own function which we shall address later. The circulatory system is also interconnected with the digestive system which provides nutrients for the heart and circulatory system as well as for other parts of the body. The cardiovascular system is a closed system, meaning that the blood never leaves the system of the blood vessels. 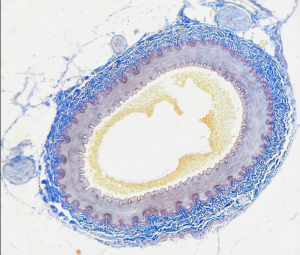 However, the blood vessel allows certain nutrients, oxygen and carbon dioxide to diffuse across its layers into what is called the interstitial fluid to be directed to the target cell. The function of arteries is to carry oxygenated blood to the various parts of the body. It begins its systemic work as it leaves the left ventricle of the heart and enters the aorta. The aorta is the largest artery in the body. All arteries and capillaries are directly linked to or can trace their connections back to the aorta. The aorta has a very thick wall which is elastic, a trait which is helpful in regulating blood pressure throughout the body. As blood vessels link off of the aorta and then further to capillaries, the elasticity of the vessel wall is diminished. As arteries branch off the aorta they continue to branch into smaller vessels called arterioles and the arterioles branch into capillaries which then merge into the system by which deoxygenated blood is returned to the heart and lungs. The pulmonary system is carried out through the veins. Veins are those vessels through which deoxygenated blood is carried back to the heart and lungs. This process begins when venules that are merged with capillaries receive carbon dioxide through their vessel walls from the interstitial fluid to begin its transport back to the heart. It flows from the venules into larger vessels known as veins and then on into either the superior vena cava or the inferior vena cava. These then empty into the right atrium of the heart. It then is pumped out of the right ventricle of the heart to the lungs where the blood exchanges carbon dioxide for oxygen and then is returned to the left atrium of the heart to begin the journey once again. Blood for the heart is supplied through a loop in the systemic circulation. It derives little if any from the blood within the chamber. 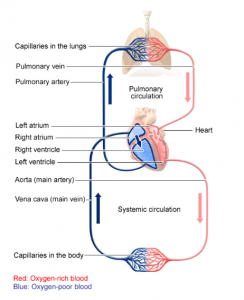 We have given an overview of how the circulatory system of the human body works. There is more to come, but this will set the foundation of how all oxygen and nutrients are transported to the areas of the body where they are needed. Without the heart and the circulatory system there would be no human life as we know it. It is one of those things that must be in place for many other systems and functions that are necessary for life. Take away the circulatory system and you take away life. The circulatory system is only one part of an almost infinitely complex machine which we call the human body. It can not survive by itself, nor could any of the other parts or systems survive without it. It is in essence an irreducibly complex system that to take away one part would cause the whole system to collapse. There are many who believe that this system developed through what is called evolution. They assume that because they have a world view based on the fact that everything that we observe in nature came about by accident. They do not allow for a greater being who may be outside of nature and who is more powerful and has more knowledge that is contained in nature. Therefore, their only recourse is to believe that all that is observed came from nothing and evolved to what we see today. When someone of this persuasion is asked to give a logical progression of how a system such as the cardiovascular system might have evolved by accident they will seldom even attempt to describe a path. More often than not they merely assume that evolution occurred. And quite often the response is, “We are here. So it must have happened.” If you accept that as a scientific statement then you have been indoctrinated. The reason most who believe in evolution believe it, is because that is all that they have been taught. Those whom they held in great respect lied to them about how creation came to be. If you were reared being told by those in authority that “the big bang” was how everything began that anything other than that was not science, what would you believe? Begin to reason for yourself. Do not discount what those in authority tell you, but do respectfully ask them to give you logical and coherent reasons for why they believe it. Ask them if there are those who are authorities in the same area disagree with their assessment. An important point to make is that “Truth” is not determined by consensus. Because everybody believes a thing does not make it true. “Truth” does not change. “Truth” is the same for one nation as for another. “Truth” is “Truth” for the dark skinned person as well as the light skinned person. Can you think of any document which has not changed from what it has stated as “Truth”? I can. It is a document which was inspired by The Creator of all that you see. He is the one Who created you. That document is called “The Holy Bible”. I challenge you to get that document and honestly and critically read it. Then make your decision. In our next blog we shall continue to look at the wonders of the human body. Until then, may God bless you. If you would like to acquire vitamins or minerals which will help you maintain a strong body and circulatory system, check the BUTTON below. Please check out our Vitamins and Supplements at this LINK.